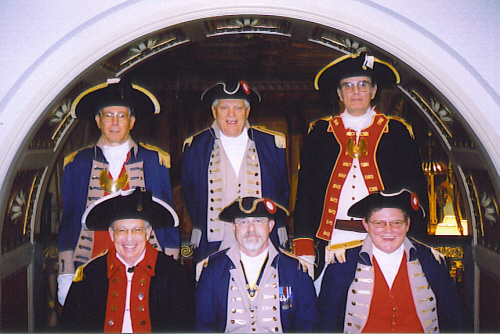 The MOSSAR Color Guard is shown here participating at the Leadership/Trustee Meeting in Louisville, KY at the Brown Hotel on September 28-29, 2007. Captain David J. Gray, a dual member from MA is also pictured here. Captain Gray is a Past National Color Guard Commander. Captain Gray and Major General Robert L. Grover both received the Color Guard Gold medal. Front Row: (L - R) Captain Russell F. DeVenney, Jr.; Brigader General Stephen M. Baldwin; and Brigadier General Gerald R. McCoy. Back Row: (L - R) Major General Robert L. Grover; Keith K. Brown; and Captain David J. Gray.